In her role with development, Lindsay oversees the Leadership Council and is responsible for all aspects of Council engagement, programming and stewardship. She strives to connect donor interests with meaningful learning opportunities about Defenders’ mission and work to defend, protect, and restore imperiled species across the United States. 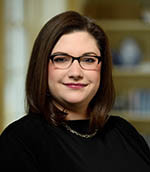 Lindsay comes to Defenders from the Johns Hopkins University, where she spent nearly eight years in development at the Peabody Institute and the Zanvyl Krieger School of Arts and Sciences. There, she worked closely with individual donors, as well as numerous advisory boards and councils, to secure and allocate funding for the areas of greatest need. In addition to her passion for native wildlife, Lindsay has held several leadership and volunteer roles with the Greenmount West Community Association, Baltimore Green Space, Baltimore Doula Project, and Maryland Zoo. She holds a M.M. in oboe performance from the Peabody Institute of the Johns Hopkins University and a B.M. in oboe performance from the University of Illinois, Champaign-Urbana.